Julie Tremblay surprised practically everyone with her amazing sculptures some time ago and we are sure that many of you still remember the interview she gave us at Yatzer. Always in the search of the new, Tremblay moved a step forward and this time she explored the territory of performance art. She collaborated with Nana Francisca Schottländer in order to mix sculpture, dance and happening in their “Everything That Happens” performance. The act took place on August 25 in Copenhagen and was a perfect way to say goodbye to the summer. Julie gave us all the details. Music: Philip Glass played by the Kronos Quartet (not a part of the original performance). The performance was conceived by Julie Tremblay and was meant as a living sculpture. 16 performers moved to a choreography by Nana Francisca Schottländer, inspired by fractal geometry and chaos theory. According to Wikipedia, a fractal is: "a rough or fragmented geometric shape that can be split into parts, each of which is (at least approximately) a reduced-size copy of the whole, a property called self-similarity”. Chaos theory shows us, through mathematical formulas, a pattern for all, even for what appears at first chaotic. In other words they show us, through repeated patterns, forms that bind the world and the universe together, from the infinitely small to the infinitely big. 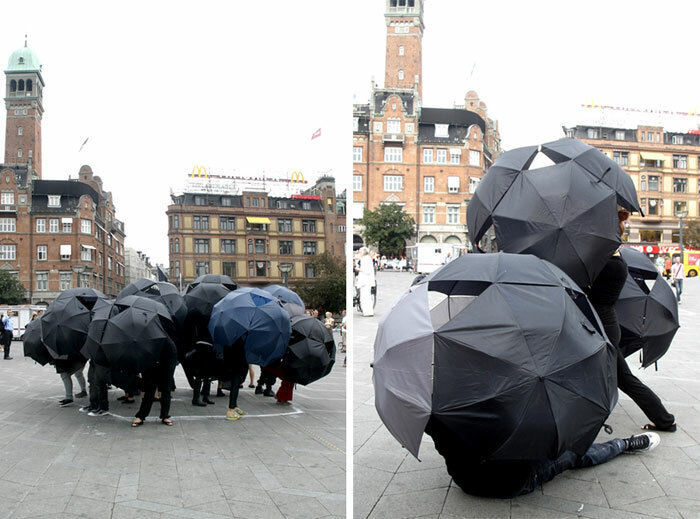 The performers, in their umbrella spheres, followed a definite, recurring geometric pattern that first divided them before re-uniting them, before re-dividing them and so on, over a period of one and a half hour. The performance met Copenhageners and tourists during one of the busiest time of the week on Råshuspladsen (Town Hall Square) which happens to be the most crowded square in Copenhagen. The structure of the choreography met the seemingly un-structured movement of the crowd, which unassumingly became a part of the performance, by juxtaposing their flow to that of the choreography. However, as Julie points out, within the structure of the choreography the performers were free to improvise as they pleased. 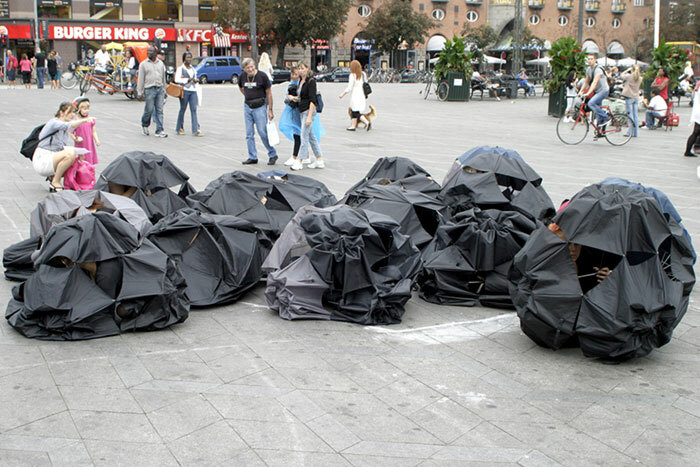 The umbrellas went quickly from being a shelter, where one can be protected from the elements, to being a symbol of fragility and memories of a storm past, a broken home. 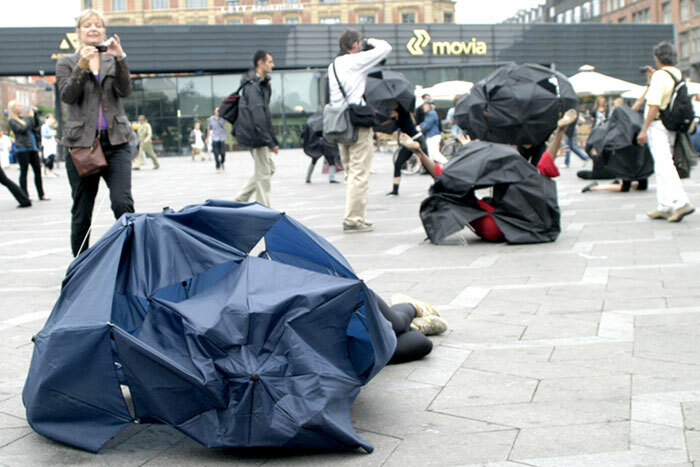 The movements of the performers and their interactions with the “umbrella-spheres” opened up to wealth of metaphors, from birth to death and just about everything in between, where the spectator was welcome to create his/her own story. 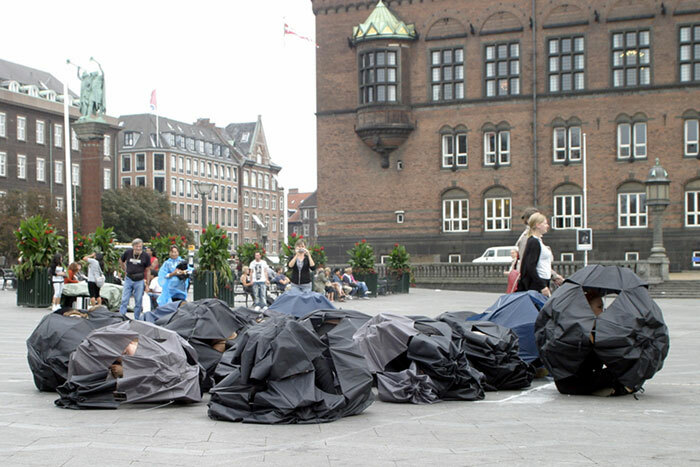 “The performance started with all the performers gathered together, under their collapsed “super-umbrella”, inside a pentagon drawn in the middle of the square. People quickly gathered around. 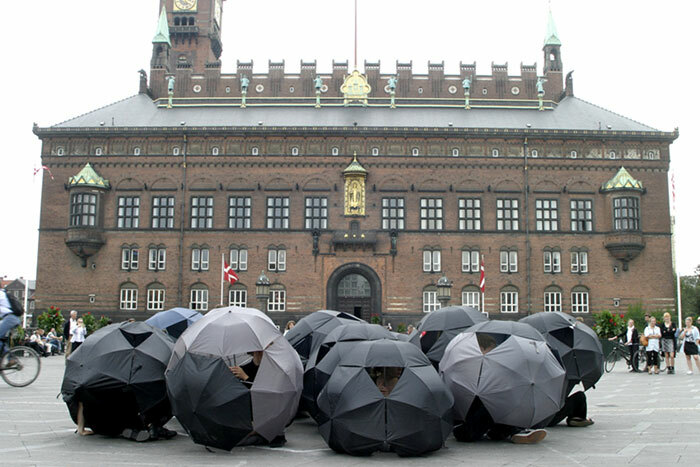 The performers opened their umbrellas, creating a sphere or bubble around themselves. They got up and after a few minutes moved out of the pentagon in order to go to their next position to create a new formation. As they proceeded, the passersby who had gathered around were no longer surrounding the performance but the performance was surrounding them. Sometimes being surprised that all of a sudden, there was a performer right behind them, thus putting them in the spotlight. Rådhuspladsen has a constant flow of people walking through it and the performance was right on their path. When new passersby arrived at a time when the performers were most spread out, most didn’t realize right away that something was going on. They’d first see one sphere and perhaps thought it was just someone doing something silly on the square, but when they saw another one and then another one, they quickly realized that something was going on and they were in the middle of it. And instead of looking at just one part of the performance, they started looking at and seeing the whole. If they stayed a while, which many did, as the performers went from one formation to another, again closing in on one another, one could see that the performance had a definite structure. Personally, seeing the performers create a center and then moving away from that center, before re-creating the said center, made me think of tides. As the performers were free to improvise within the structure, they created different metaphors. Metaphors for life and death, for relations between human beings. They each were in their own bubbles, but interacted. They were at times strong and at times, vulnerable, fragile and hurt. People laughed at times and perhaps touched at other times. There was something that was both funny and touching, and that is where I think that the power of the performance lied”. When we asked her for he upcoming plans, Julie told us that she was working on new sculptures for a solo show in Canada in 2010 and on the same time she was examining the possibilities of bringing Everything That Happens to other cities, other busy squares. 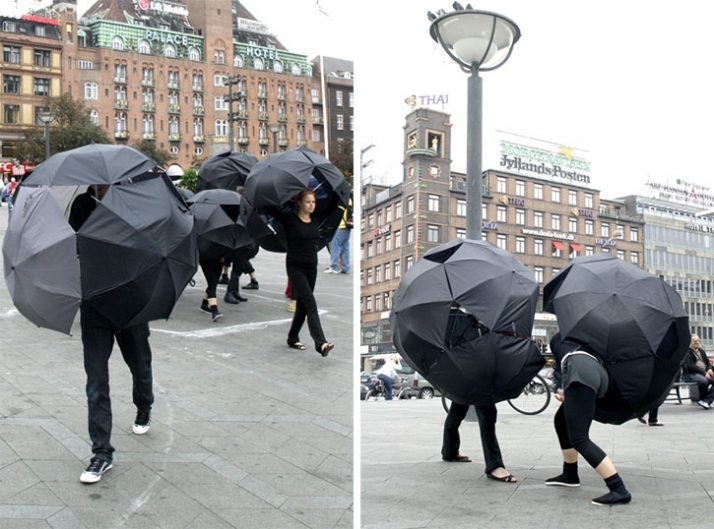 So, in case you meet some dancing umbrellas on your way home, don’t be surprised. It will be Julie’s fault! Julie Tremblay is an artist originally from Québec, Canada and now living and working in Copenhagen. She has an MFA from Pratt Institute in New York. Through sculpture, she has been working with the human body for over 12 years. She is represented by Galleri Rebecca Kormind in Copenhagen and Craig Scott Gallery in Toronto, Canada. Nana Francisca Schottländer is an inter-disciplinary artist, working within performance, dance and and stage direction. She has studied in New York, Spain, Japan as well as in her native Denmark. She has been elaborating performance projects, choreographies and stages since 2001, as part of a long term collaboration worked with Signa Sørensen, among others. The performers were: Barthelot Ekeme Same, Maria Jørgensen Kaack, Laura Baruël, Anna Luna Holmberg, Anja Karoline Karup Nielsen, Keren Gelfer, Aviaja Kragh, Ida Møntegaard Fredericia, Karl William Fegerlund Brekke, Nele Rickelt, Zenia Helene Madsen, Amalie Obitz, Aya Urhammer, Naja Jessen, Adrian Ulrich Skjoldborg and Lotus Omim.